Shearing was a bit up in the air this year. Last year I had wanted them shorn early May but we couldn’t get a shearer until late May, it wasn’t too bad but our sheep shed their fleece and we lost a lot of wool. This year we are lambing in May which meant that we had to carefully consider when to shear. If you shear too early the ewes can get cold, if you shear too late then you increase the risk of fly-strike. This is where flies lay their eggs in the sheep’s fleece and then the larvae eat away at the sheep. It’s not nice at all and can be fatal. After a bit of reading I decided that shearing pre-lambing would be best for our situation. There’s a good article here listing some pros for shearing pre-lambing. The girls pre-shearing 2016 with a lot of wool already shed. Last year the shearer cut through the fleece and got a lot of new wool through. Each year there is a ‘break’ in the fleece which is a weaker point. When you’re working with the fleece for crafting getting the new wool along with the old wool means lots of little pieces that come away, it makes things a lot harder. This year I looked for a shearer that would cut the fleece for crafting, thus just cutting the old fleece away. I found one who said he would, but he wouldn’t touch the ewes until 3-4 weeks after they have lambed. A lot of shearers are reluctant to deal with in-lamb ewes as it can risk abortion premature birth. Later shearing would put us into late June/early July and really increase our risk of fly strike. It looked like we would have to wait until after lambing though if no-one would do it. 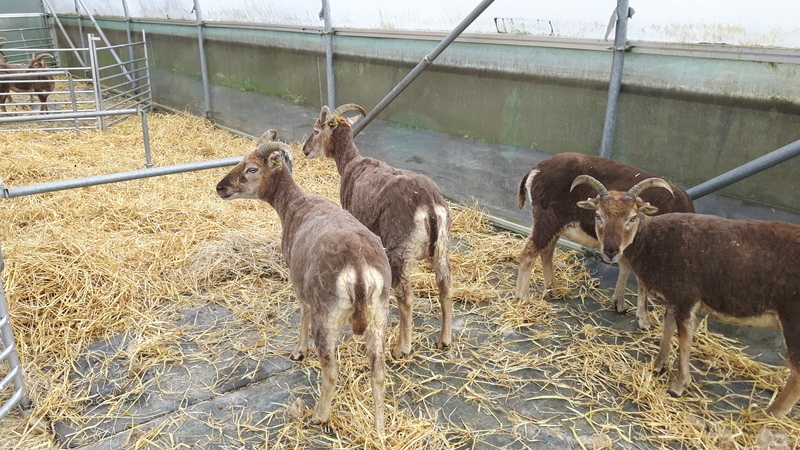 Then a nearby smallholder posted photos of his newly shorn sheep by some handshearers. I didn’t have anything booked in with the shearer so I contacted these guys, the Two Stand Blade Gang. I have always loved the idea of hand shearing and would love to learn to do it myself. It’s a bit harder on your hands but is meant to be on the ewe and less stressful as you don’t have the heat, vibration and noise of the electric shears. It’s also meant to be easier to cut just the new wool. There’s also the fact that it is a traditional skill. I’m all about trying to preserve the ‘Old Ways’. It’s often interpreted as me taking the hardest route to do things, but knowing that our ancestors worked for centuries to find the best way to do things before the invention of all this electronic technology, and that in some cases the knowledge is at risk of being lost really saddens me. They were happy to shear for us but preferred to shear pre-lambing rather than after. That’s what I wanted to start with but we were now 2 weeks before Arya’s due date so cutting it quite fine. It was the Sunday that I messaged them and they were able to come the Wednesday. Getting the lambing area ready and all the girls in before the rain hit was a challenge but we managed it. It went really well. They were nice and gentle with the ewes and limited horn handling which was refreshing. 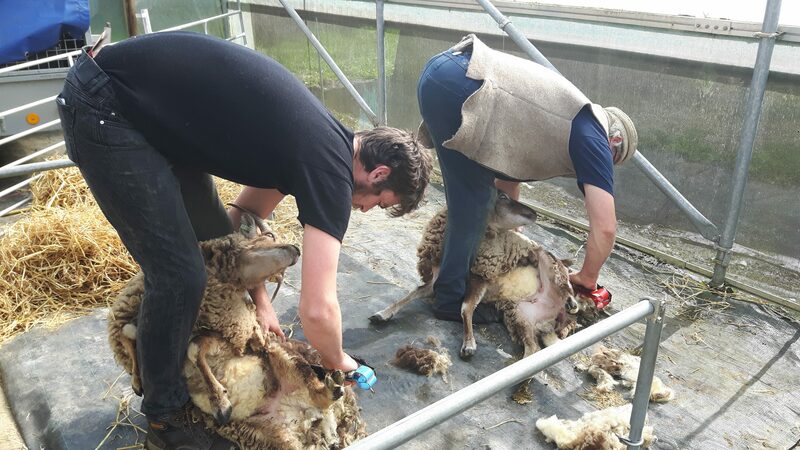 The ewes seemed less stressed by the shearing than last year, which may be due to the lack of machinery or could be due to it being their second time. We had the pregnant girls penned up separately to the empties, we had tried penning together but the empties started chasing and butting the pregnant ones almost immediately. We got nice clean cuts on the pregnant girls and the wool looks really nice, no breaks. The empties had started to shed and this is possibly due to being on rougher grazing. The guys had a bit of a harder job with those two but they still did a good job. 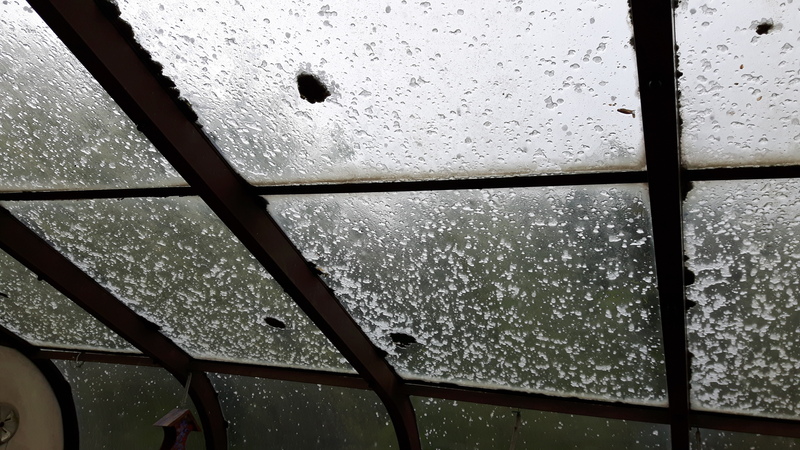 Unfortunately, the weather decided to batter us with hail and sleet just after shearing so I think I will keep them in for a couple days. They should be ok outside with a bit of shelter as hand shearing leaves a bit more wool on them than machine shearing, but we also have the hassle of taking the empties across the road which will be easier when it’s not throwing hail down at us. Friday should be nice and clear and we don’t have groups that we need to take Chi to which makes life easier. The pregnant girls have eaten the grass down in the area they were in. 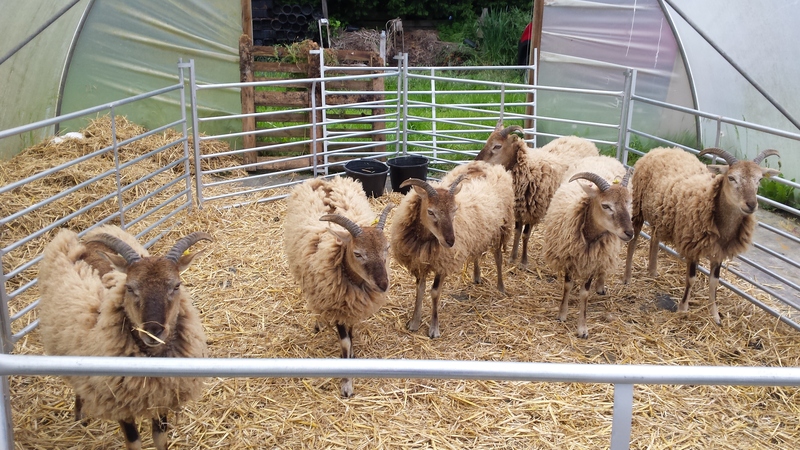 So, despite Sam having come up with a race system to get the ewes into the polytunnel for lambing, we’re going to move them into the Triangle for the time before lambing. The lambing box is all set up with everything we should hopefully need so now we just sit and wait. One of the upsides of having them shorn is we can see them a bit better. Arya is starting to bag up (that’s when they start to fill up with milk), but surprisingly Aeryn (carrying twins) and Arha (possibly carrying twins) are not far behind Arya in terms of bagging up. So they may actually lamb sooner than we thought. We’ll be keeping a close eye on all of them.